Artist-led groups come together in Bristol for a day of discussion and presentations about collaboration. Artist-led groups, spaces and initiatives from the south west, south Wales, the midlands and beyond converge on Bristol tomorrow (17 November) for Interplay, a series of discussions, presentations and performances organised by artist collective Hand in Glove (Leela Clarke, Vickie Fear, Dominique Hill and Cara Lockley). Billed as ‘a social exchange and celebration of artist-led practice and collaboration’, the event kicks off at 2pm with a pecha kucha (six minute presentations with up to 20 images) from Cheltenham’s MEANTIME and KARST, Plymouth. Other organisations doing pecha kuchas during the day include The Motorcycle Showroom, Bristol, and Back Lane West, Redruth. Twenty-five organizations are represented at the event, which also includes ‘speed dating’ sessions with Leeds collective Topical Jungle and a long table discussion hosted by MEANTIME, MEZZ (Stroud) and VINYL (Birmingham). Artists from Bristol Diving School will testing their balancing skills as they take the form of a human pyramid as part of a discussion about the restraints, distractions and constraints of collaboration. 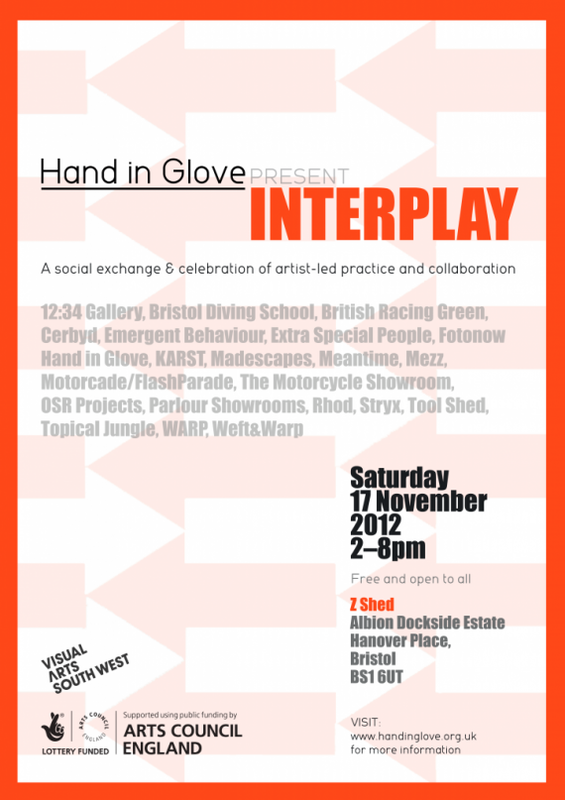 Interplay, Saturday 17 November, 2-8pm, Z Shed, Albion Dockside Estate, Hanover Place, Bristol.